Maximum productivity and exceptional durability from this high-capacity punching powerhouse. Up to 144 sheets of 20 lb. paper! Durable all-metal construction for years of superior performance. High-quality, sharp cutting heads for clean 9/32" holes and perfectly aligned presentations. Plastic pad for extended punch head life. Adjustable paper guide for superior placement and depth control. Two or three-hole punching flexibility. So far this is the best 3 hole, hole punch we have ever had it punches through be stacks of papers with a breeze. We use this hole puncher in our office everyday. It goes through stacks of paper instantly. Welcome to MyBinding video. 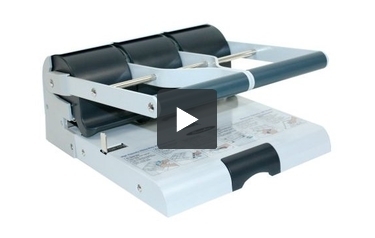 This is Swingline’s High Capacity Adjustable 2-3 Hole Punch. This high capacity punch has maximum productivity and exceptional durability. It’s built to last for the high output office. The adjustable paper guide adds for superior placement and depth control. Double handy grip allows for left, right or both handed operation. The sharp cutting action can handle up to 144 sheets of 20 pound paper. We tested it out with 80 sheets. It’s a little bit difficult, the punches were perfect. This high capacity punch works with both 2 and 3 hole punching and you can change the pins around as much as you’d like. With a simple turn of the screwdriver and following the guides below, adjustments can be made in a snap. All three punches land on a plastic punch pad for extended punch head life. There it is. That’s Swingline’s High Capacity Adjustable 2-3 Hole Punch. For more demos, reviews and how-to’s, check out MyBinding.com. Swingline is the manufacturer of some of the best staplers and hole punches available. They even have a high-capacity punch that can produce both two- and three-hole patterns: the Swingline 74650 High-Capacity Adjustable Two- and Three-Hole Punch. Here's an in-depth look at this product so you can decide if this device is what you need for your punching needs. As the name of this product suggests, this device can produce both two- and three-hole patterns. This is very convenient because you'll be able to use this item for all of your punching needs whether your documents are going into a three-ring binder or file folder. The holes this device punches are 9/32” ensuring that the pages of your document will turn freely when placed in a folder or notebook. The holes will always be cleanly punched as well. The 74650 has an adjustable paper guide that will allow you to properly align your paper before punching it. Using this feature ensures that your items will be processed properly and that you won't need to punch them again or start over with new paper. This device has a handle that's nice and big so using this product will be easy. It's D-shaped so both right- and left-handed people can use it easily. One of the best things about the 74650 is its construction. It's mostly made from die-cast medal so you'll be able to get a lot of use out of it for a long time. Plus the punch pad is made of plastic which ensure the punching heads will last much longer. The 74650 comes with a 100% performance guarantee so you can be confident that this device will work for a very long time. Also, it's backed by a 180-day warranty so you're covered just in case anything happens. The Swingline 74650 is a really impressive hole punch and one that would be ideal for schools and offices. A 144-sheet punching capacity is simply incredible and it will enable you to punch as much paper as possible in the least amount of time. It's great that it can do both two- and three-hole punching since this will eliminate the need for separate punches. All of your sheets will be cleanly punched and the holes will be aligned perfectly when you use the adjustable paper guide. You'll also appreciate this product's durable construction and its 100% performance guaranteed. Overall, the 74650 is a terrific hole punch, so consider getting one for your office or classroom today. You won't regret it. If I order additional replacement heads, can I create a 7 hole punch instead of 3 hole punch? Does this model offer that feature? Thank you for your question. You are not able to add additional punching heads to the Swingline High Capacity Adjustable 2-3 Hole Punch, just replace exisint head. You can find a punch that you would be able to add heads to here . We are able to order the additional heads for the Master 525M as apart. Reach out to our customer service department at 1-800-944-4573 and we can get a quote on those. How far apart are the holes in the 2 punch option? Thank you for your question. The dies are adjustable and the spacing can be adjusted down to the standard 2 3/4" 2-hole spacing. Adjusting the spacing is not something that can be done "on the fly" with this punch. It requires a screwdriver and you have to adjust the placement of the punch pad from the bottom of the base. I'd like to replace the cutting discs on an older model for this heavy duty high capacity punch. Could you please tell me how to remove the old cutting discs so i can install new cutting discs? Is there anyway to fix the punch if it does not punch all the way through all the pages? Please ensure you are using 20lb paper. This punch works best with 20lb paper. Can we sharpen the punch head pins instead of replacing it? These models work best when the punch pin is replaced. How do I know whether my Model 74650 was made before or after 2006 so that I can purchase the appropriate replacement heads? Where can I purchase replacement punch heads for the older Model 74650? The replacement kit is A7074872 for the 9/32" heads and A7074874 for the 11/32" heads for the current punch. Is there an adjustment i can look at? You can find the replacement kits for this punch on our website. The replacement Kits for the punch are A7074872 for 9/32" hole punch diameter and A7074874 for 11/32" hole punch diameter.